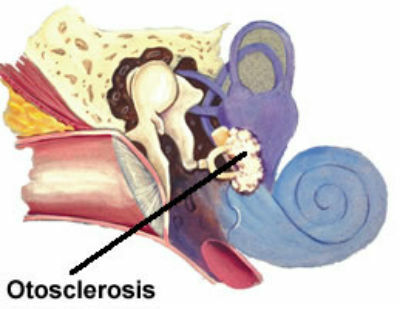 Otosclerosis is a chronic, gradually increasing form of deafness that often begins in early adolescence. Its true cause is not known. In this condition the little stapes bone extending from the middle ear becomes fixed and can no longer move freely within the oval window of the inner ear. Spongy bone grows around the opening preventing all motion, and causing a gradual loss of hearing. Often the first sign of trouble is ringing in the ears. Several excellent operations have been devised to correct this condition, the most popular at present being the stapes mobilization. In this operation the surgeon gently lifts the ear drum forward, exposing the middle ear. He then relieves the pressure on the stapes, so that the little bones can move freely once more. After this operation most patients can go back to their normal work in few days. In more advanced cases, the stapes may be replaced by stainless steel wire, or a plastic bristle may be used in place of the little bone. Another useful method of treatment is the fenestration operation. In this the surgeon makes a new oval window, covering it with a tiny skin graft from the ear canal. Thousands of patients have had their hearing restored by these intricate operations on the ear. Others have greatly benefited by using a good hearing aid.